The third time was unquestionably the charm for an RIT photography professor whose successful attempt at a National Science Foundation (NSF) award has broken the paradigm of the traditionally left-brained grants. The collaborative project will combine anthropological, visual and historical methodologies to approach how social, cultural and environmental changes are experienced in Greenland—a massive island and autonomous Danish territory located between the North Atlantic and Arctic oceans. Defibaugh’s project centers on the work of Rockwell Kent, photos and art used as a starting point to engage contemporary community members in the Greenland communities of Illorsuit, Sisimiut, Nuuk and Uummannaq. Kent was an American artist and writer who lived in Greenland in the early 1930s and produced an extensive collection of photographs, art and literature about his time in the country. 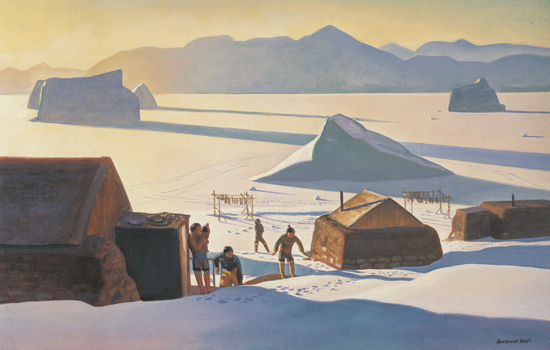 His work and its contemporary influence illustrates the connected history and continued relationship between the United States and Greenland. Defibaugh’s initial two NSF proposals, which were rejected, centered on photography of the country. “Still, I felt I was getting stronger support and encouragement from NSF to try again,” he said, specifically noting NSF Program Manager Anna Kerttula de Echave. He also received unwavering support from Charles Bush and others in RIT Sponsored Research, ultimately leading to approval of the $645,155 award. Working with a U.S. and Greenlandic social scientist and a Greenlandic historian, Defibaugh will examine the role of historical photographs, literature and art and their relationship to contemporary notions of social, cultural and environmental change in the Arctic. Kent’s works as well as his relationship with Greenlanders will be examined through interviews with decedents, oral histories as well as written correspondence between Kent, Greenlanders and Danes. Findings will be discussed with community members and photographic workshops will be held in each community with students to encourage contemporary youths to produce their own representations of their communities. Defibaugh said he plans to display student photos and discuss them alongside Kent’s original works and his contemporary documentary photographs during community exhibitions. The visual works will be utilized as vehicles to discuss representations of Greenland, Inuit cultures and constructions of continuity and change—including environmental, social and cultural shifts from the 1930s to the present. Defibaugh left for Greenland in late April and his research will continue through 2017. He plans to blog about his experience while there and will share his work on social media.